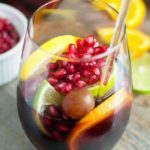 Use a fruity red wine to make this Red Wine Citrus Pomegranate Sangria and flavour it with oranges, lemons, limes and pomegranate. Easy to make, and just sweet enough. The holidays are almost here and that means it’s time for a toast! 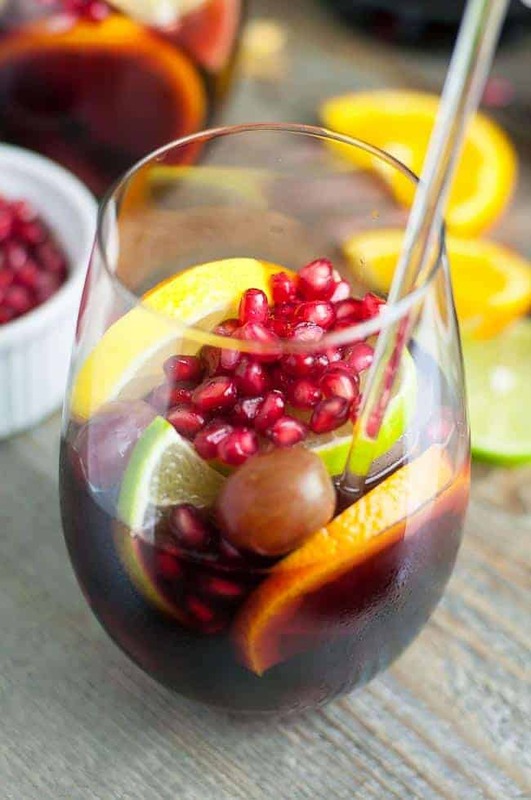 This Citrus Pomegranate Sangria is very easy to make and perfect for holiday entertaining. 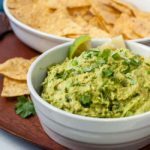 Rich with Vitamin C from oranges, lemons, limes and pomegranate, it is full of flavour but not too sweet. 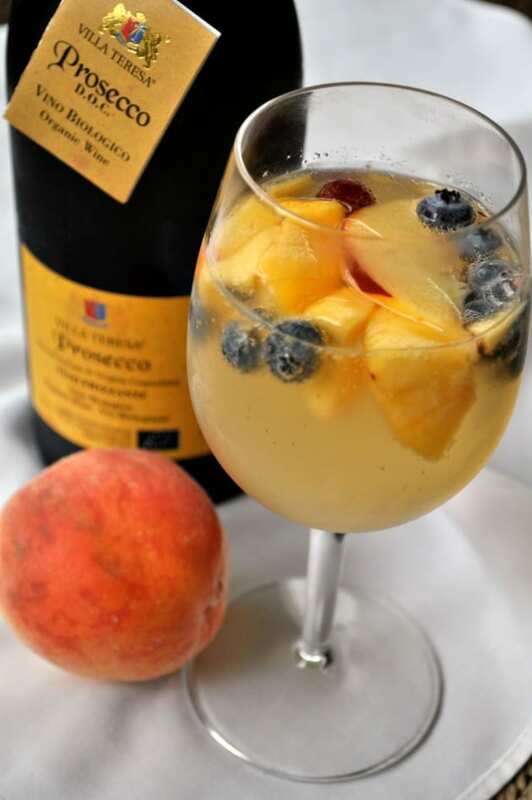 And just look at that glass brimming with fresh fruit! One of the things I love about this festive drink is that I can make it ahead of time. 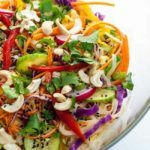 If I’m having friends for dinner, it seems there are always a few things that have to be done at the last minute, so I look for ways to streamline dinner preparation with make-ahead dishes. 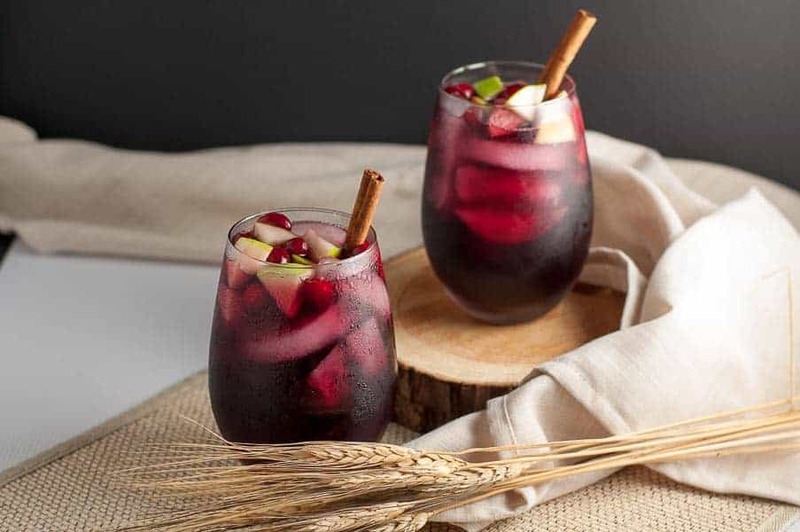 This red wine sangria can easily be made the day before. In fact, it’s actually better if the flavours have had some time to blend. 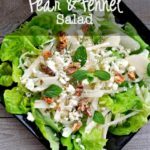 You’ll need a bottle of wine, some fruit juice, a liqueur or brandy, a sweetener like simple syrup or honey, something sparkling and lots of fruit! For this recipe, I chose a blended red wine, pure pomegranate juice, an orange liqueur, simple syrup and sparkling water. I added sliced oranges, lemons, limes, pomegranate arils and a few red grapes. 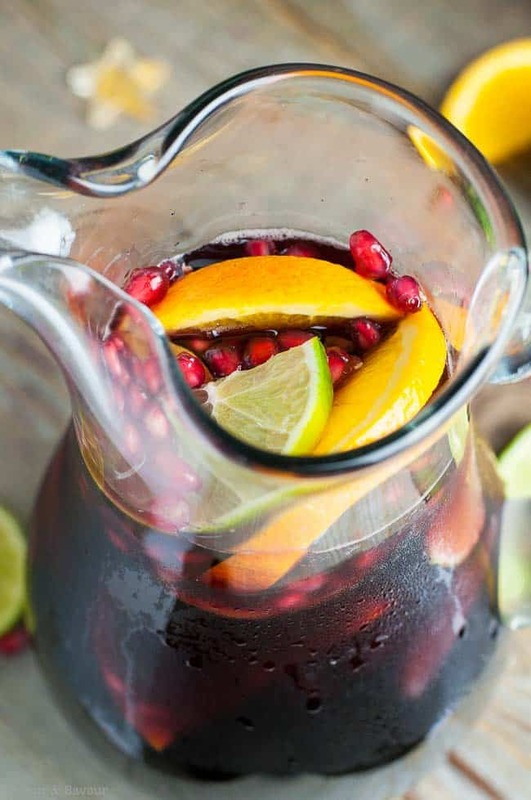 This Citrus Pomegranate Sangria is so simple! Mix everything together, except the sparkling water, and refrigerate for a few hours or overnight. Then, when your guests arrive, fill a glass half full with ice, pour, top up with sparkling water and serve! Cheers! 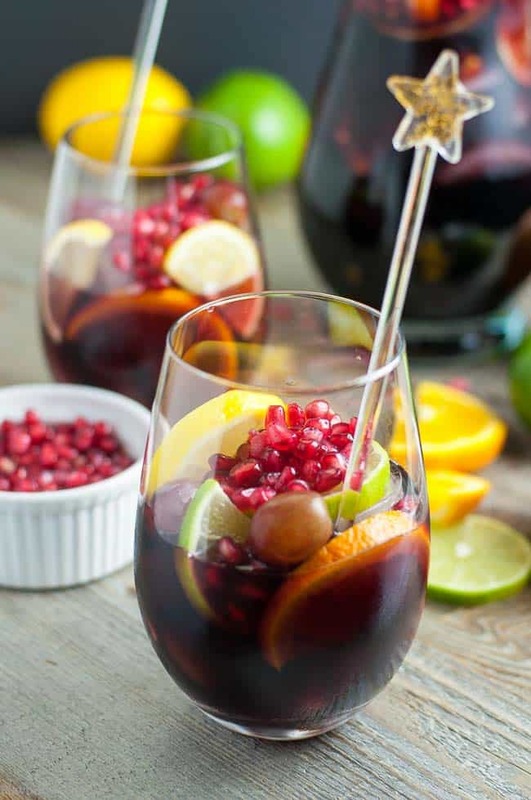 This Citrus Pomegranate Sangria is very easy to make and perfect for holiday entertaining. Rich with Vitamin C from oranges, lemons, limes and pomegranate, it is full of flavour but not too sweet. Celebrate! In a large pitcher, stir all ingredients together, except sparkling water. 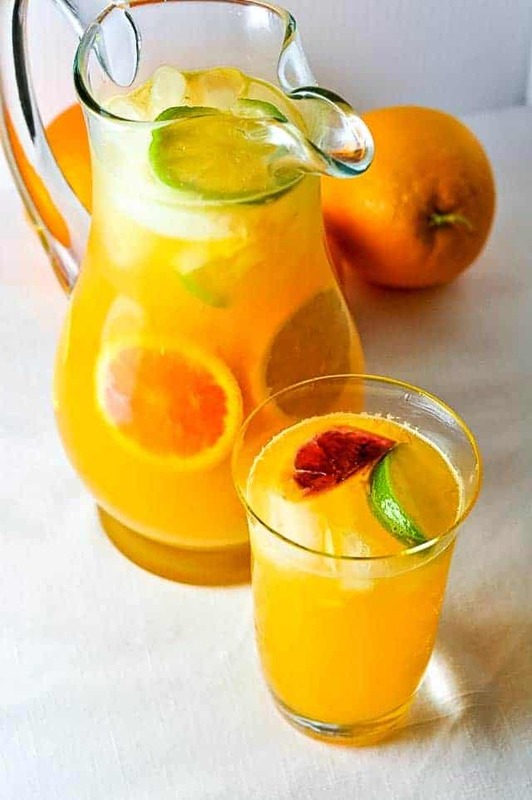 Add fruit to pitcher. 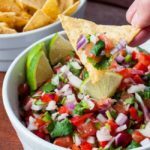 Chill for at least 2 hours, (and preferably overnight) to allow the flavours to blend. Pour over ice and top glasses with tonic or sparkling water to add extra sparkle, if desired. To make simple syrup, heat equal amounts of sugar and water until sugar dissolves, then cool. If you use honey instead of simple syrup, you may find that it settles to the bottom of the pitcher. Just give it a stir before serving. 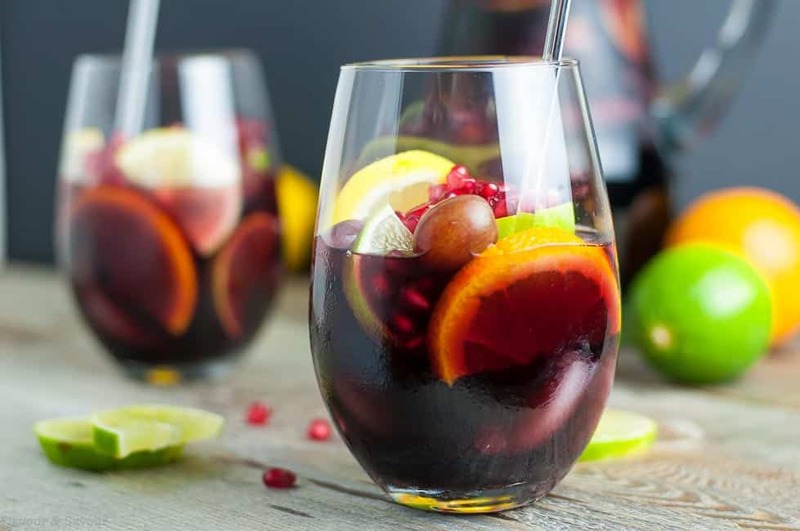 If you’re a Sangria lover, like I am, you’ll love these other Sangria recipes too! This is so pretty and festive, absolutely perfect for the holidays!